Borders MP John Lamont making his maiden speech in the House of Commons during a debate on June 2017's Queen's Speech. New Borders MP John Lamont used his maiden speech at Westminster to call for the Borders Railway to join him south of the border. 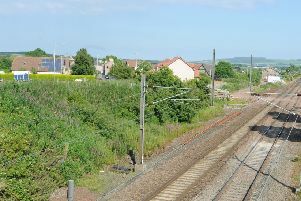 Calum Kerr’s replacement as member of the UK Parliament for Berwickshire, Roxburgh and Selkirk, highlighted the case for the 30-mile railway to be extended, via Hawick, into England duringthe debate on this week’s Queen’s Speech. Mr Lamont is calling for the Borders Railway to be extended beyond Tweedbank. Adding another 56 miles to the £350m Edinburgh-Tweedbank track to take it into Cumbria would be a breakthrough for the Borders’ economy because of the potential for job creation that would bring with it, he said. “The creation of an environment that allows for job creation is something that I will make a priority,” said the Conservative MP, previously MSP for Ettrick, Roxburgh and Berwickshire. “In my view, creating good-quality jobs is the best way of lifting people out of poverty. “Effective and sustainable transport links, including the extension of the Borders Railway to Hawick and on to Carlisle, together with better broadband connectivity and improving other infrastructure, will be the key in pursuing this. The Borderlands growth deal proposed by UK Prime Minister Theresa May in her general election manifesto, negotiating a favourable deal for Britain’s exit from the European Union and fending off the threat of a second Scottish independence referendum would also be crucial to boosting his home region’s economy, said Mr Lamont. “The challenges and opportunities thrown up by Brexit for my constituents – especially export businesses, farmers and fishermen – will be of fundamental importance over the coming years,” said the 41-year-old. “I will work tirelessly to help ensure that we come out of this process even stronger and even more together than we are now. “Specifically, I look forward to working with the Government on establishing the Borderlands growth deal that will not only secure economic prosperity but deepen ties between communities in southern Scotland and northern England. “These communities may be divided by the borderline marked on the map, but we share many of the same challenges, and the Borderlands growth deal gives us the opportunity to tackle these together. “Whether at war with each other or side by side in war, the nations of our great country have always been intertwined, and our deep, lasting ties are impossible to disentangle. “Our common ridings and festivals, which display such pride in one’s identity yet symbolise an overarching feeling of unity, are striking. “Pair this with the rich history that all the nations of our union share and it is clear that we have more in common with each other than not, that we are together worth more than apart. Mr Lamont added that he was looking forward to representing towns not within his previous Holyrood constituency such as Galashiels, Melrose, Earlston and Lauder.